If you've never tried Swagbucks before because you didn't know where to begin, their Team Challenges are a great way to learn the ropes! 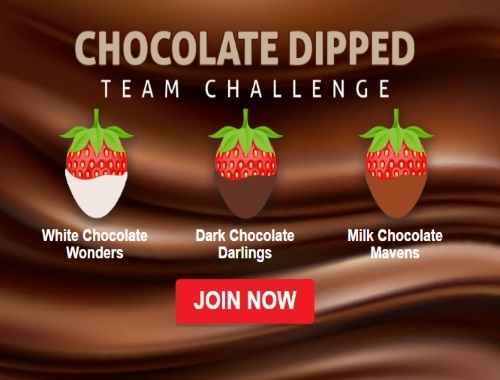 They have one themed around Valentine's day - the Chocolate Dipped Team Challenge begins Monday, February 13. 2. Starting February 13 at 8am PT, in addition to earning SB you'll contribute points to your teams total as you complete different activities on Swagbucks. All members who participate and contribute at least 400 points to their team’s total will receive a SB bonus in the form of a SB Swag Up Rebate on their next gift card! Not only that, but if you earn 300 SB before March 1st, you'll get a 300 SB bonus (as long as you've signed up under me)! Members of the 1st place team will receive a 50 SB Swag Up Rebate, members of the 2nd place team will receive a 25 SB Swag Up Rebate, members of the 3rd place team will receive a 10 SB Swag Up Rebate. Your SB Swag Up Rebate will be made available on Friday, February 17 and will expire on Tuesday, February 28 11:59pm PT.